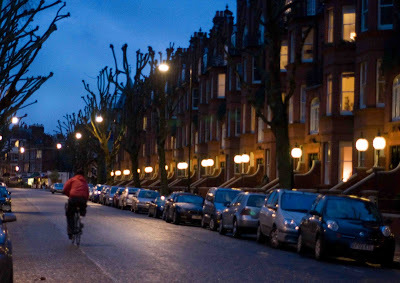 A street of Edwardian townhouses in the mainly affluent inner city suburb of Maida Vale. An area that has always been residential once belonging to the Bishop of London. Churchmen of the past were an affluent lot it seems. Has much changed? I really like the blue color in the sky in this picture! Looks like a pretty area of town. Just look at the Vatican! Beautiful array of houses and lovely sky. Ciao. A. Well obviously not much has changed ... except for the cars of course! :-) You didn't find an old photo or postcard? another great composition. you caught the light just perfect at dusk. thanks for stopping by my site to enjoy the vibrant fuscia cactus flower. I'll be back. You have a great eye - dusk is my favorite time of day to take photos, when the lights are visible and the sky just glows. I'm amazed to see how much these pictures resemble Boston, especially this one- which could be Marlborough Street in Back Bay. Wonderful blog. I hope you can post some interiors, too. Excellent picture, Mo! It's totally magnificent!